July has been kind of an off month for me and I didn't fully realise it until I wrote this monthly recap. I can't think of any specific reason for it so I'm going to blame it on the fact that its winter. July just couldn't keep up the momentum created by a successful June. I ended up eating out a lot and having take out a bit too often as well. I do have two meals to share with you though. Kane discovered a place that sells prawn crackers near his new workplace so he picked up a couple of bags for us. 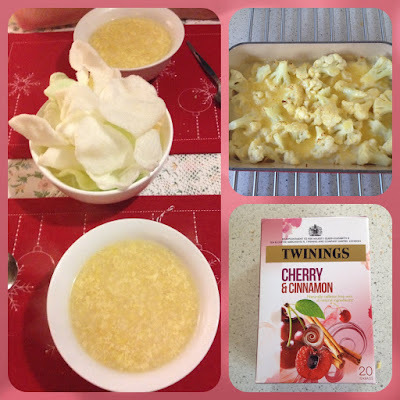 Back in the old country we would often get prawn crackers and sweetcorn egg drop soup. I've never even seen egg drop soup on sale here so I needed to learn how to make it and I was so surprised just how easy this is! We had it about 3 times and I'll definitely be making it again. The other thing I made this month was roasted cauliflower cheese. I'd never tried roasting the cauliflower first and I'm glad I tried this variation. It really gives a different flavour to this classic and we both enjoyed it a lot even though Kane's not normally a fan of cauliflower. The third picture above is of cherry and cinnamon tea. I've had it quite a few times this month and its a really nice warming winter tea. A surprisingly low mileage month considering I had two races this month and I'm in the middle of two race series and training for the Auckland 12k. Again, I'm just putting down to having an off month and I'm hoping to get my mojo back soon. I managed a PB for my 2.5k race but with such a low mileage month I'm a bit nervous about the upcoming 5k. I also only managed yoga about twice this month too. I went on Monday and it felt so good at the time, but then I ended up sore for the rest of the week, I think maybe my body is fighting an illness, because so many people around me are sick at the moment. I haven't finished any books this month. 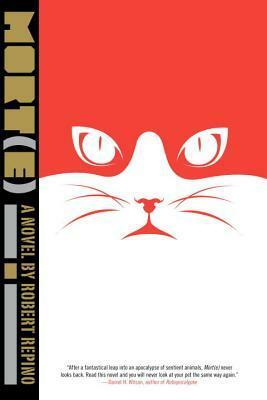 I'm currently reading Mort(e) by Robert Repino but I can't seem to get into yet. I've got a couple of other books from the library that I need to read so perhaps I will switch to one of those others ones for now. Ha, I remembered to take a picture of an outfit I wore to dinner with Kane's friends and former work colleagues. I ended up being so paranoid about the V being too low that I stapled it! I was happy to wear my gray heeled boots though because I've been living in my flat ankle boots all autumn and winter. 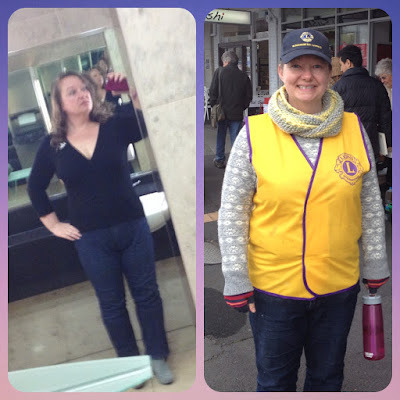 The other picture is of me in my fetching Lions vest and hat :) My Lions Club run a sausage sizzle and a second hand book stall at the local monthly market day to raise funds for the community. I do love working market days because I really feel like part of the community. 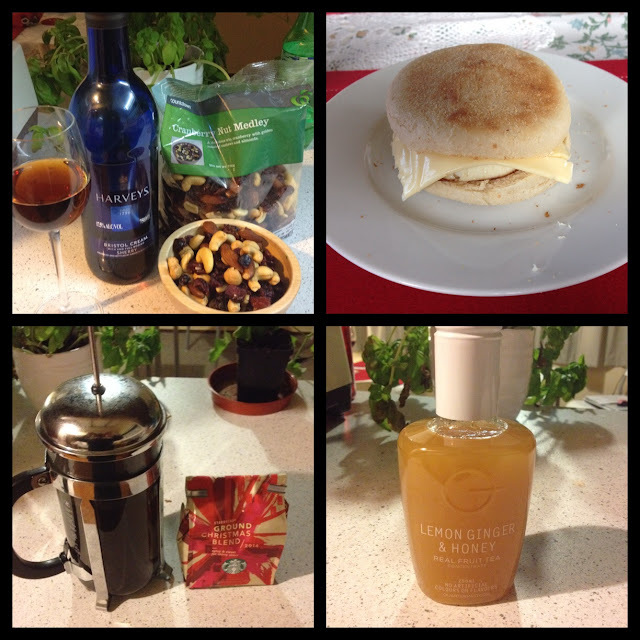 What were your Meals, Miles, Books and Looks of July? Last week was our last pub quiz for a while because the new term of indoor soccer is about to start which means Kane's going to be busy and since we are a team of two, I don't think I'd do so well on my own! Even though there are only two of us, we usually do quite well. Last week we missed out on winning by 1 point. I was gutted because we had two answers that we were undecided about and chose the wrong answer instead of the right one bah! so close..
Our local pub is a fairly large English style gastropub. It changed hands a couple of years ago and went from English themed to Irish themed and had a bit of change in décor. There's only two pubs in the suburb and this is the biggest and most popular one. 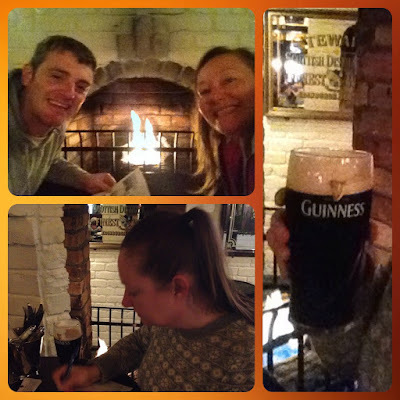 There's two fireplaces in the pub and since it's winter I try to get as close to them as possible! 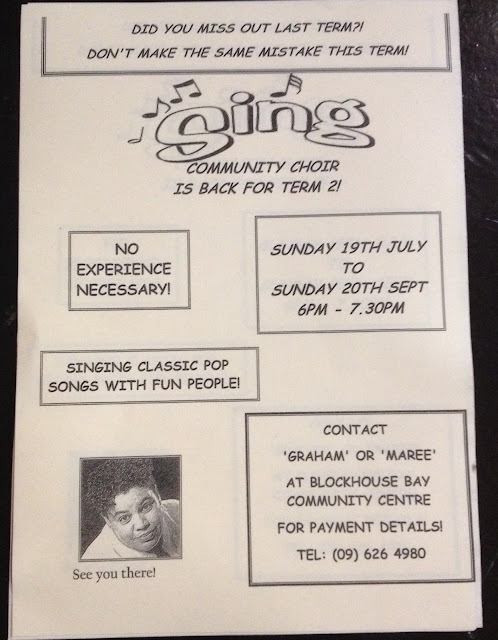 At the weekend the pub is pretty busy serving lunches and dinners and then they have live music at night. They also show sports and go all out for the big games, but I'm not really a fan of anywhere when it's too noisy to hold a conversation. I do like that it sponsors the local NZIHL ice hockey team though and we've been to the pub to watch some of the NHL games in the past. This pub actually helped sell us on this neighbourhood! After we viewed a nearby house we came into this pub and loved it and we decided that we wanted to live in this area. We know many of the bar staff and have friendly chats with them when we visit, and we always go there for a dinner or a lunch when we have our parents visiting us. 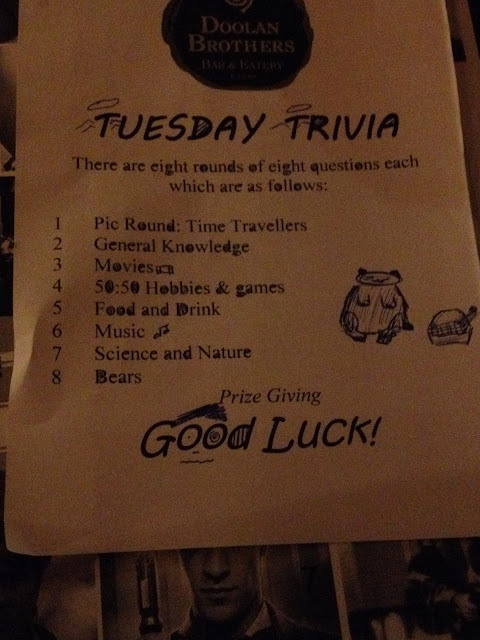 Although we've come in for meals, drinks and we've played pool too, my favourite is the trivia night. The rounds are always interesting and it's usually done before 10pm so it's not too much of a late night for a week night. I have a habit of doodling on the trivia forms - I'm not a very good artist, the above picture is supposed to be a bear with a picnic basket haha! Do you have a local or regular bar or coffee shop you like to go to? 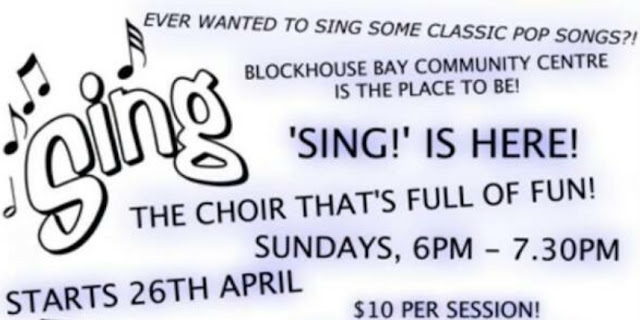 Our community choir has been in existence for a whole 8 week term now, we've just started our second term and we're starting to sound like a real choir! 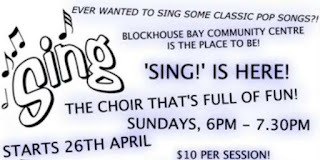 There are about 17 of us in total and after the first practice or so, those of us that were willing got split into 2 groups to do harmonies. The Green and Yellow harmony groups have 4 people in each (I'm in Green) and the rest are in Red who sing the main melody. Harmonies are kinda hard because at times it feels like singing off key on purpose and its even harder if its a song with a melody you know well. Right now we have learned 7 songs, which are older pop songs from the 60s, 70s and 80s, and the choir director has told us we'll be getting a Motown medley soon. At the end of last term we really shook it and did a bunch of new things. Instead of sitting in our semi circle facing the stage, for the first time we were on it! Standing on the stage we are starting to learn to project and fill the space with our voices. Which also meant no lyric sheets! I found myself not knowing what to do with my hands and missing having something to hold on to. I think a few of us were the same, we didn't need the words as much as we needed to hold the paper! And we also got to sing some of the melody (where we don't have harmonies of course) and that really punched up the volume. That made it really fun for us Greens and Yellows since we have had to stay silent and concentrate on our harmonies. We're obviously sounding good enough that we can start practising the switch from melody to harmony and back. I am so impressed by my fellow choristers and how far we've come in our first term. In our first practise back of the new term, we were a little ropey at times, but we're doing this Tracey Chapman song and when the melody and harmonies come together it sounds so good! We are working towards putting on a performance for our families and friends on the 20th September and I'm really looking forward to it. Reading: Mort(e) by Robert Repino - it's about animals and I'm scared it's gonna be sad. Watching: Wayward Pines. I binge watched the first 9 episodes and now I'm waiting for the series finale. I've had lots of interesting discussions with people about it. Feeling: A bit fatigued lately. Some things seem to be more of an effort than usual, I'm hoping I can shake off whatever it is. Thinking: About the 5k that's coming up next week and trying not to freak out about it. I did much better than last year in the 2.5k but I don't feel as fit for the 5k as I did last year. Anticipating: The pub quiz tonight but sadly it might be our last one for a while as we have other plans next week and then Kane's indoor soccer, which has been on hiatus for term, starts back. Listening to: Podcasts! I haven't gotten into any since Serial but I thought I should try out ones that I've seen other bloggers recommending and so far I quite like the Dear Sugar one and have listened to two episodes of that. Wanting: To cook more. I haven't made any proper meals for a while and I feel guilty about that. Needing: To save money for a planned trip next year. Grateful: To Kane for already getting our ice skates sharpened, that's one less thing I have to think about this week. Wishing: For a dry day on Saturday as I'm working our Lions Club barbeque at the community market day to raise funds to help those in need in our local community. What's going on with you currently? Got any podcast recommendations or recipes I should try? After a PB at the RunWalk 2.5k and then catching a cold, I hadn't done any runs during the week and wasn't sure what I could expect of myself on race day. Friday night and Saturday was spent resting up, making poor food choices and watching TV, mostly due to the torrential rain. My pre race dinner was hot chips, cheese and gravy which was too tasty to regret! After a good nights sleep, we were up early as this race was about a 1.5 hour drive away, but with the bad weather and unfamiliar roads I factored in 2 hours. I had toast and coffee breakfast and we headed off. The weather cleared up really quickly and it was a beautiful drive to Waiuku Forest through part of Auckland that I hadn't been to before. We had to park a bit of a walk away but we arrived with over 30 minutes to spare so I had a soy latte from the coffee cart. I realised that I had forgotten my water, and I could have bought some, but there's a water station on course and I felt that would be fine. After the race briefing, we crowded up to the start line and off we went. The first part of this race was a downhill so like the last race Kane and I decided to just start running with the crowd. 0 - 3 km The first km, was along the road (shown in the top two pictures below) and then we turned and headed along a forest trail which was covered in pine needles it was soft to run on. Then we came out at the beach. I think the tide was coming in and we ran in single file along the black sand, jumping and climbing over tree trunks and drift wood. after a short while we climbed back out and into the forest again. 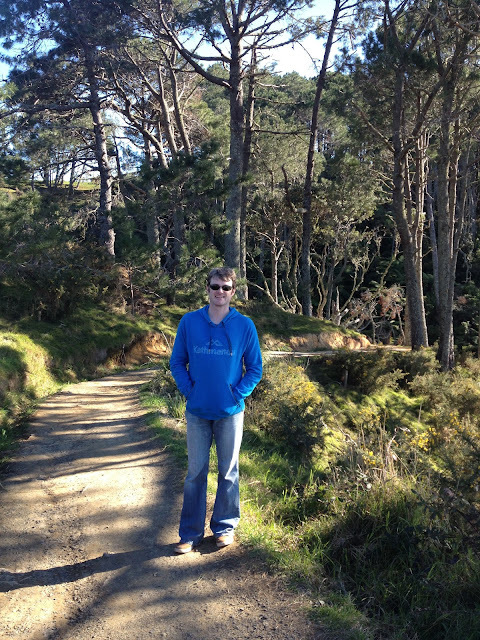 At first I thought the trail was muddy, but when I ran on it I realised it was sand. How strange to find sand in the forest with the pine trees! It made the downhill parts easier on the knees but the uphill parts could be tricky if you walked, it was better to keep the feet moving faster. Thankfully this race was not very hilly. 3 - 5 km It was around the 3km mark when the first of the super fast walkers over took us. We came out onto an uphill road and this was where super fast walker Jan (who told us of this series) passed us, marching very quickly up the hill. At around the 5km mark we had reached a hill top with beautiful views over the sea and we knew we were now headed back towards the finish. 5 - Finish We got overtaken by 2 senior citizens who were walking and I jokingly said to Kane that I was feeling demoralised. I was actually really impressed by the speed and agility of the couple and it reminded me of one of the reasons that we chose to live here in NZ because one day I want us to be like that old couple. Kane reckoned that we only had a km to go and I thought that would be about 2 songs worth of running away, so I started to sing a song in my head to keep me from stopping and walking. We hit a small incline and I had to walk a little but then we came out onto the road that we had parked on so I knew we weren't far away then. Further down the road we turned off back into the trails and it was a flat run to the finish line. I was really pleased with how this race went. 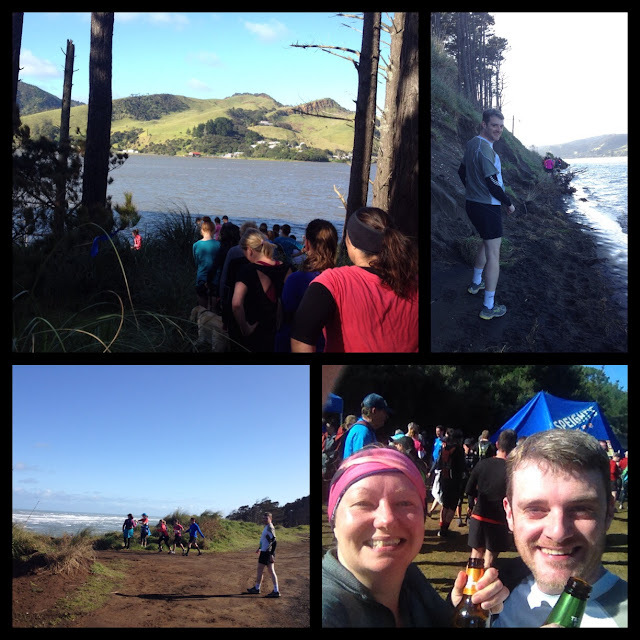 I think it was the flattest of the trail races we've done so far and we ran most of it which felt great. It was such a beautiful course with the water, hills and trees, we are hoping that we can come camping here in the summer. 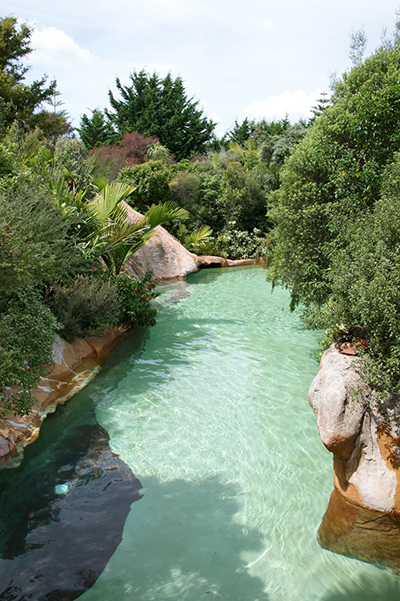 The Coromandel is a popular holiday spot in NZ with its sandy beaches, geothermal hot pools and stunning scenery. 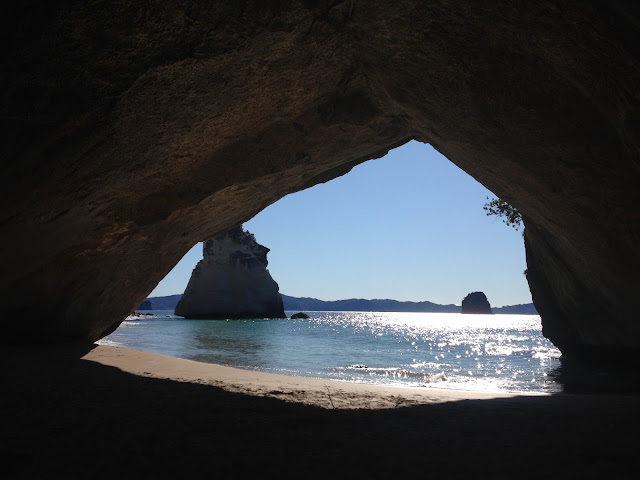 Cathedral Cove is probably the most visited place in the Coromandel and I can't believe it took me so long to visit! There is a small car park at the top of the hill and its about a 20 minute walk to get to the cove. 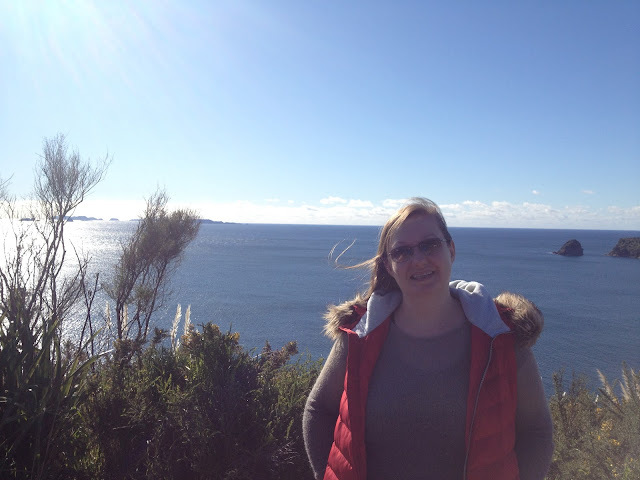 We were treated to beautiful sunshine with a cool wind and amazing views. 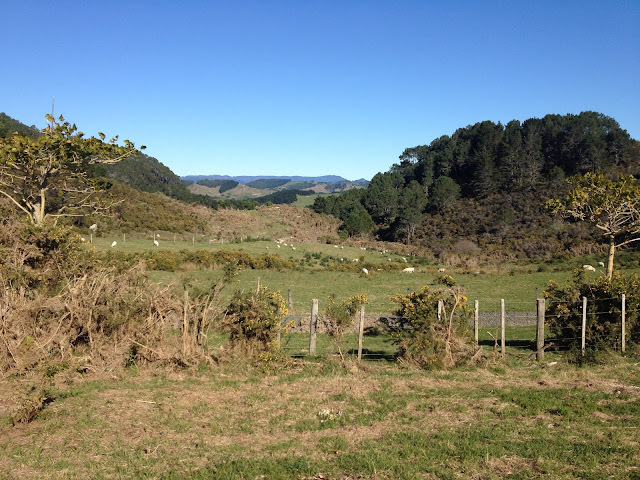 As we travelled along the path, we had the sea on one side, and pastures with sheep on the other. 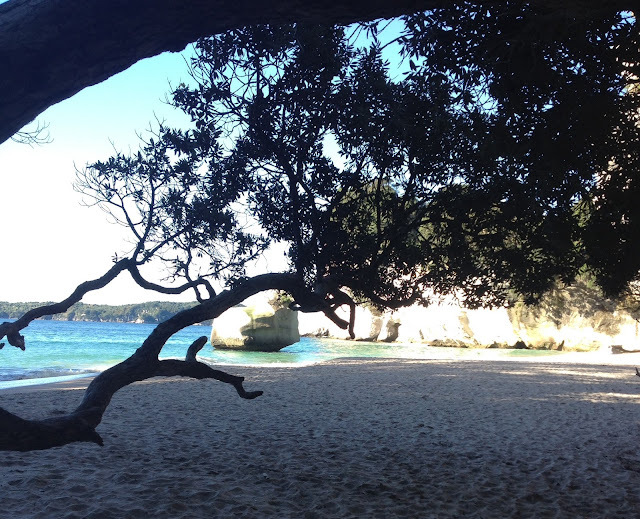 And after a while and down some stairs, we popped out on the beach. 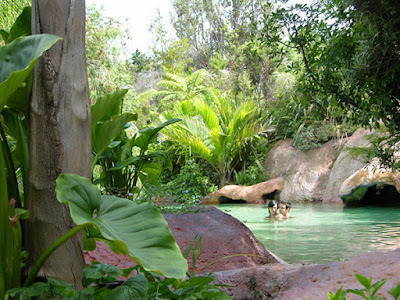 What's your favourite beauty spot? Is there somewhere that took you a long time to visit but you're so glad you did? On Sunday the first race in the Run Walk Series that leads up to the Auckland Marathon (and other distances) was held. I've entered the 1 lap series that leads up to the 12k event. I did the same series last year and I'm hoping to show improvement over last years effort. Personal Bests for 1km and 1 mile! We had our usual pasta dinner the night before that's been a pre-race ritual for years now and headed off to bed at a reasonable time. I did have an invite to the movies, but I knew that I wouldn't have been in the best form if I'd had a late night. As it was, we were a bit rushed in the morning getting out the door, so breakfast was shredded wheat for me and muesli for Kane instead of our usual porridge or toast and beans. It was a really cold morning and we noticed frost on the ground as we drove to the event. 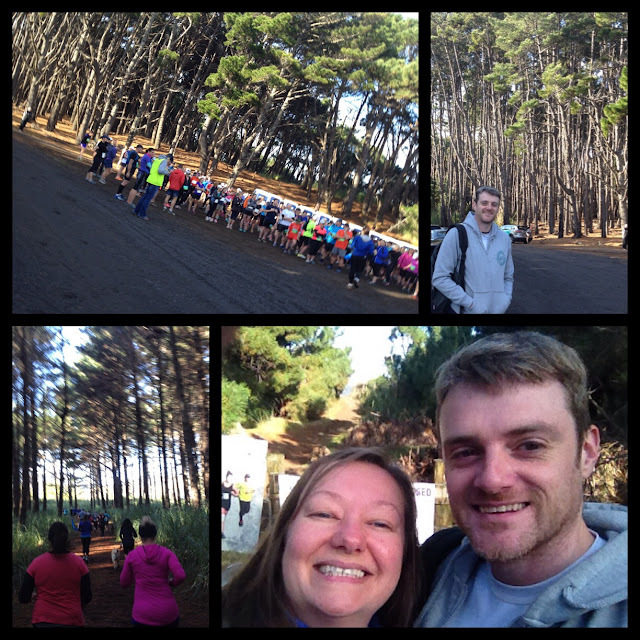 There was hardly anyone around when we arrived and we got our race numbers, chips, and series t shirts easily - no queues! Kane was wearing a long sleeve and a short sleeve shirt and decided to switch out his short sleeve for the series T shirt which looked really cool. I stuck to what has become a race uniform of my long sleeved Lululemon shirt and tights but wore my running gloves as well. I jogged and marched a little in the queue warming up and waiting for the start gun and when it went off I started running straight away. I had placed myself towards the back of the line since I'm quite slow but I was mildly frustrated with the people further up the queue who were walking and I had to negotiate running around them. 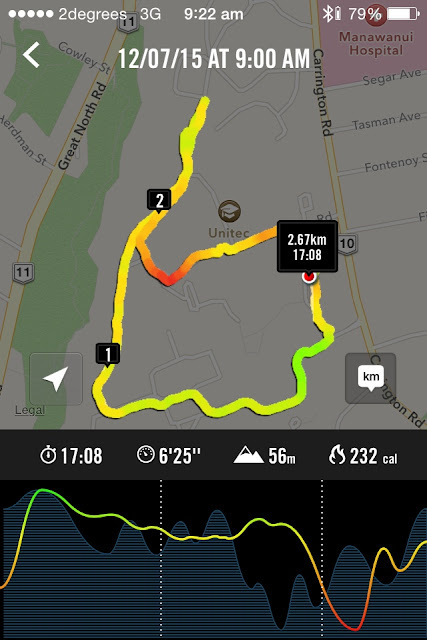 Even though there were some small hills, I totally powered through this first 1km. I may have started off too fast but it's a short race and I needed to get through the walkers. I was so happy when my app told me I had done just over 1 mile in 10 minutes, it's been a looooong time since I last ran 10 minute miles! I felt like I was on target to beat my time for last year. Not long into the 'there and back' part of the course I saw Kane heading in the other direction and gave him a wave, and then just passed the turn around point I waved to my friend Kelly (she's doing the 2 lap version this year) and then just before 2km I spied my friend Carmy but she was too focused on the task in hand to see me. I was already feeling slow when the course turned and headed up a hill. 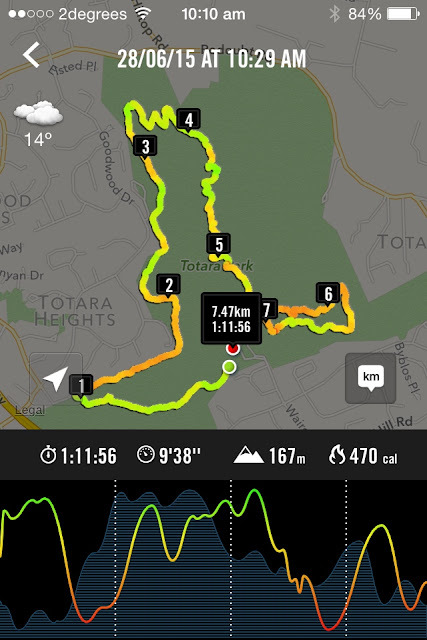 I gave it my best and pumped my arms and got me up the hill, but then I felt like I had overexerted and felt sick. I walked a couple of steps on the flat but I didn't want to waste my hard work so forced myself into a jog, thankfully there was a gentle downhill where I got myself feeling normal again and then it was the long gentle uphill all the way to the finish. I'm certain most people wouldn't have noticed my "sprint" finish, but I put what little I had left into pushing it over the finish line. I tried to stop my app, but couldn't with gloves on and it took a little longer than it should have to get the glove off! Kane was already long over the finish line by the time I came in. He had done it in 11:50 which was 14s faster than his time last year but he didn't get the first place that he did last year. Carmy did better than last year too with an amazing 3:29 shaved off her time. Kelly had upped the ante this year by opting for the 2 lap version and achieved a PB for her 5k. We all headed off to a café for coffee and cake to celebrate! The high of my week was getting stuff done. I'm not entirely sure what I achieved, but I really feel like I achieved something! The low of my week was chickening out of going to a Pilates class I haven't been to before. Maybe next week I'll feel braver. For my workouts, I completed 1 hot yoga class and 2 treadmill runs. The best money I spent was on a Guinness at the pub quiz on Tuesday - it's been a while and really hit the spot. It was Kane's birthday a couple of weeks ago and it'll be my turn in little under 2 months. We decided a few years ago to try to take a trip somewhere to celebrate instead of buying presents. What happens though is that we feel too guilty to not buy gifts so we still end up giving something and we go on a little mini vacation somewhere. 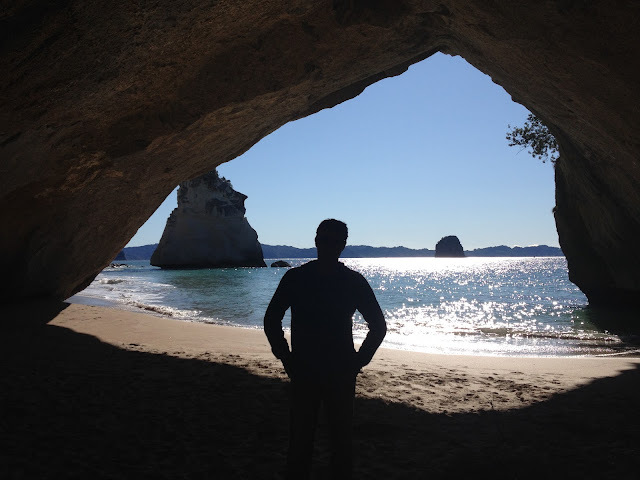 Since Kane had a week between finishing up at his old company and starting a new job we thought we would take the week away in Queenstown, but with crazy weather, oversubscribed flights and an influx of tourists for the winter festival we decided not to go. 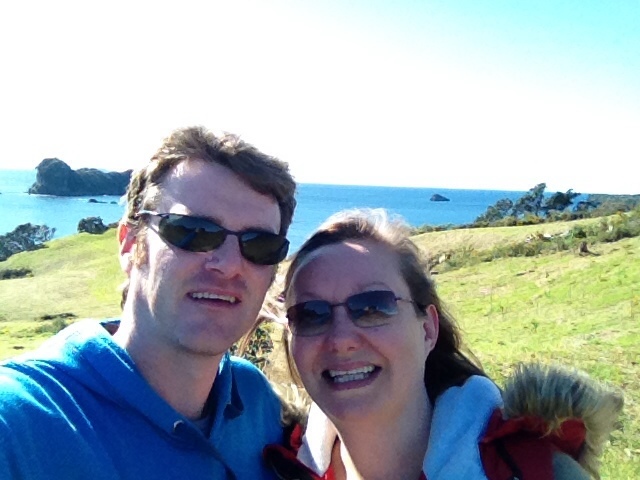 Instead we went to Whitianga. 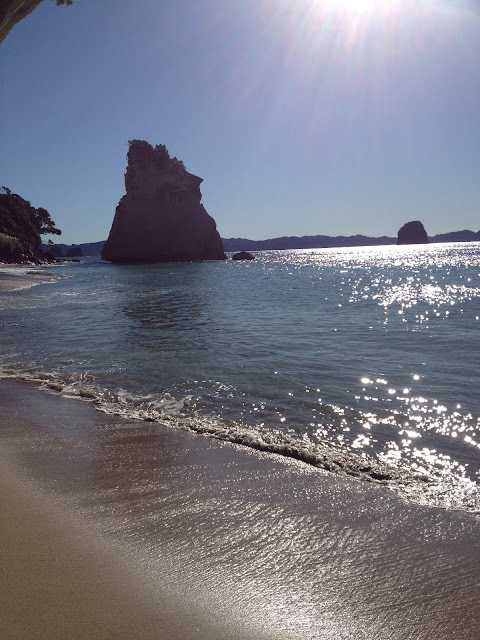 Whitianga is a lovely seaside town that's a very popular destination in the summer and was just perfect for a quiet winter break. We stayed at the Beachside Resort apartments and our unit was lovely, spacious, clean and comfy. Kane tried out the spa bath that was in the ensuite and really loved it and I tried out the supplied toiletries and really liked them. I was sad that we didn't get a chance to try out the pool as it looked really nice and I had even brought my pool noodle with me. There was a poolside bar but also there was a staff member who came round occasionally to take food and drinks orders or to bring you a glass of water and generally check if there was anything you need. So friendly and helpful! We ordered some food and cocktails and had them whilst still basking in the warm waters! 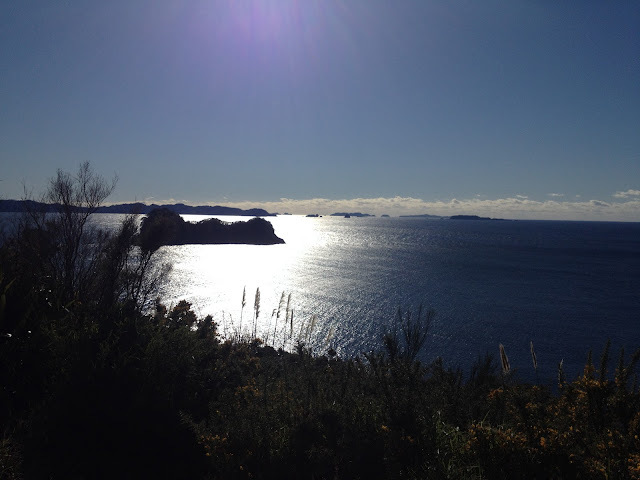 Although they had some soft unobtrusive island music playing, during the daylight hours we were treated to bird song and watched the fantails flit around. Once it got dark, parts of the pools colourfully lit up as did the cave and the waterfall, the walkways and bridge had some soft lighting to carefully navigate by. But the lighting was at the right level as not to take away from the spectacular natural light show of the stars and moon. We lay in a comfy spot in a hot pool and just gazed up for ages, then we took a swim to a darker spot and got an even better view of the milky way. 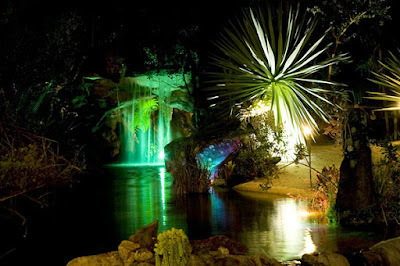 I overheard a couple of ladies who had arrived as it was getting dark and it seems that they regularly visit the springs after work and I thought how wonderful that must be! 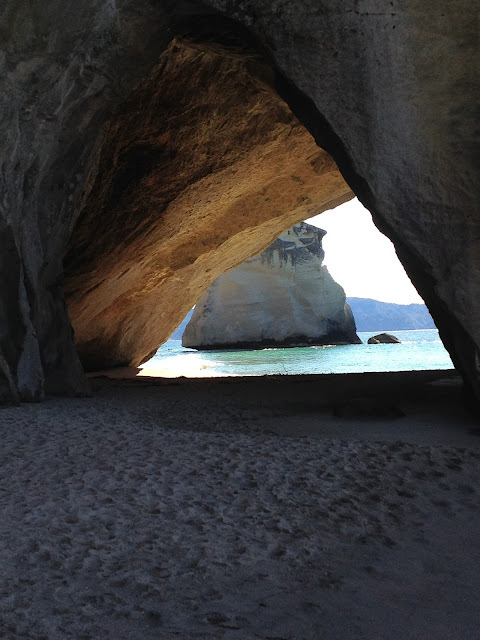 In part 2, I'll tell you about our trip to Cathedral Cove. I am stuck on week 7 but I actually feel pretty good about it. I only have 4 more runs to go before I can complete this couch to 5k program. So far I have been able to complete day 1 and 2 of running for 20 minutes non stop and I'm really pleased with that. I think of this as being the foundation to running, once you can run for 20 minutes then you can really start to build on all sorts of things. 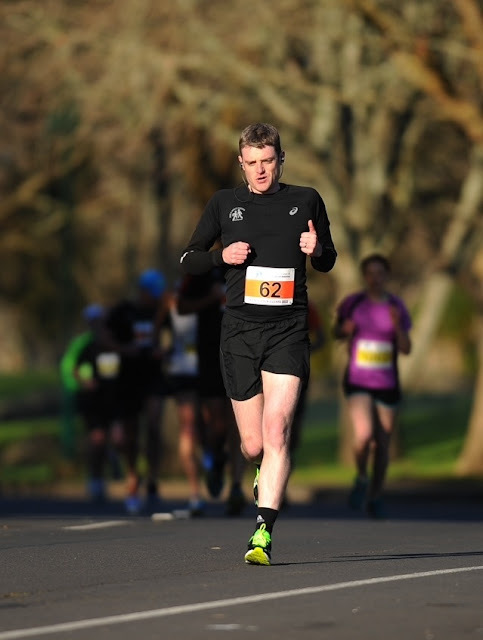 At the end of this week is my first race in the Unitec Run Series that leads up to Auckland Marathon (or in my case, the 12k). This race is a 2.5k road race with some hills and I'm still unsure whether my goal should be to try and beat last years time or try to run it all, both are good and challenging goals. Only 4 more of these scheduled runs to go before I can complete the couch to 5k program and I'm pretty happy about that. Sure, its taken me much longer than the 8 weeks but I'm really pleased that I've stuck with it and haven't given up. I'm looking forward to achieving this goal! Woohoo I made it to Friday! The high of my week was - it's a tie between a really great yoga class on Monday or my second 20 minute non-stop run on Tuesday. The low of my week was not being very organised with lunches and having to buy lunch everyday. 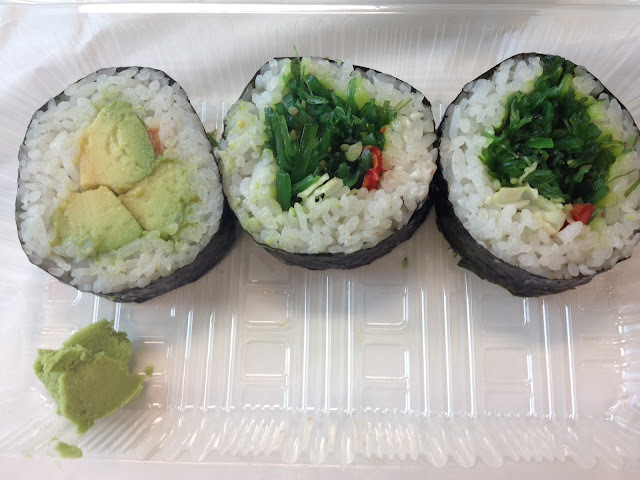 Its hard to believe that avocado futomaki and seaweed futomaki with wasabi could ever be a low! A book I'm reading is going to be one of the 3 books I just checked out from the library - probably Mort(e) about a sentient warrior housecat in the battle between humans and ants. 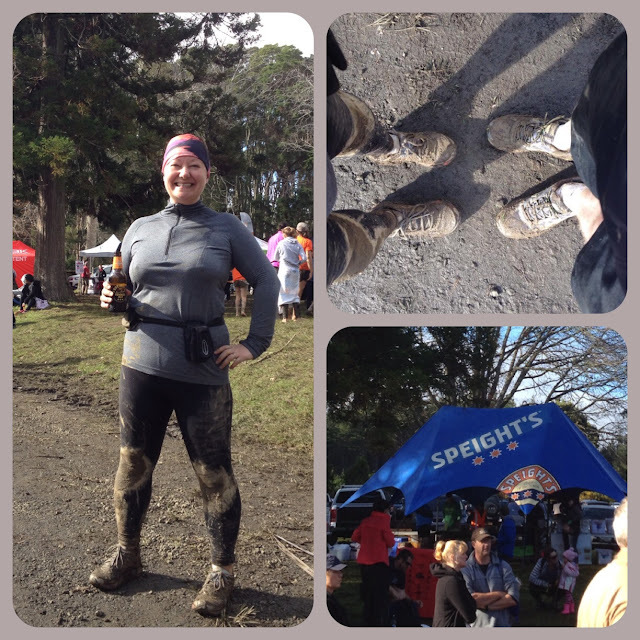 For my workouts, I completed 1 trail race, 1 treadmill run and 1 yoga class. My plans this weekend include ice skating, watching ice hockey, helping take out a kitchen from the senior citizens hall, yoga, a run and hopefully season 3 of Friday Night Lights. 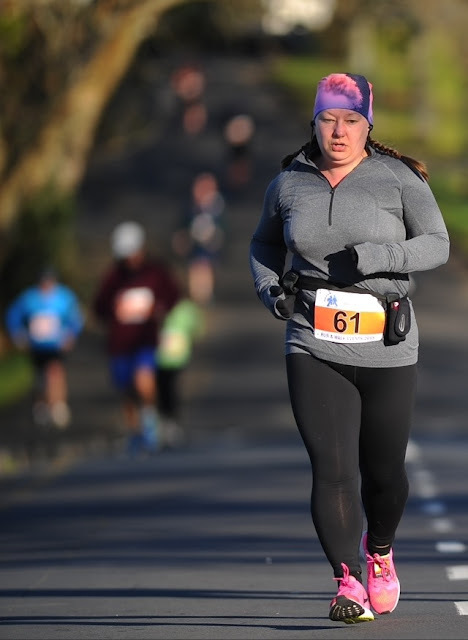 I had been on holiday the week before this race and hadn't done any running - shame on me - however this meant that I went into this race feeling fresh. I love that these races start at 10.30am and this one was the least driving distance away so I stayed in bed maybe a bit longer than I should have. Breakfast ended up being toast instead of the usual porridge and I felt like I could have used something a bit more substantial later on during the race. 1 - 2 km was an uphill section that I mostly walked but we were on a dirt and gravel road and I was super grateful that there was no mud like last time. 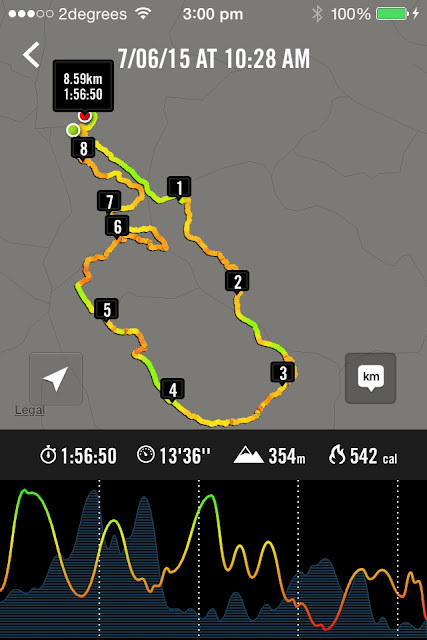 2 - 3 km was a mixture of flat and gentle up uphill sections. We were told there would be a water station at 2.5km and we felt like there should have been one here but there wasn't. This made us think that we hadn't even done 2.5k yet and we started to doubt that we had been going as long as we felt we had! 3 - 4 km was a lovely long downhill stretch but it was a super narrow single track and you had to watch your footing very carefully. It was a bit difficult to pass people here but we managed to pass quite a few. 4 - 5 km this was where there water station was! 5 - 6 km there was a bonus water station here too. This was the start of a loop so we saw people coming in the opposite direction and they had the uphill bit, we went off to the left but all the way round I knew that the evil hill was coming! 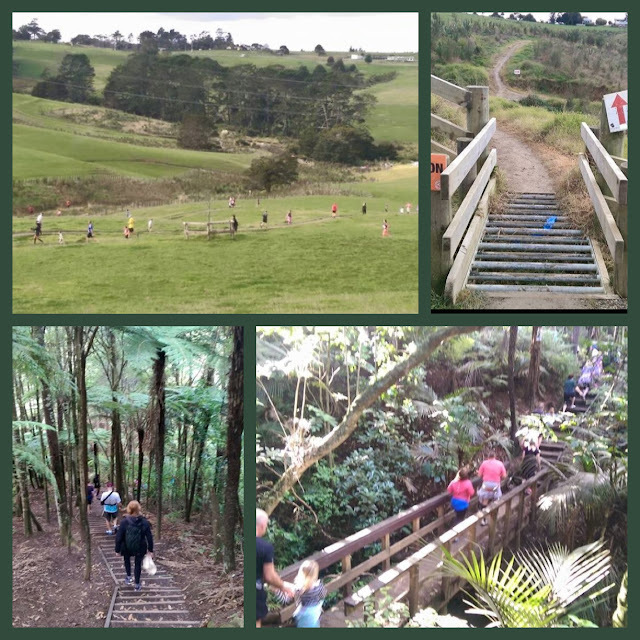 We were in a wooded trail and there were lots of stairs going up. 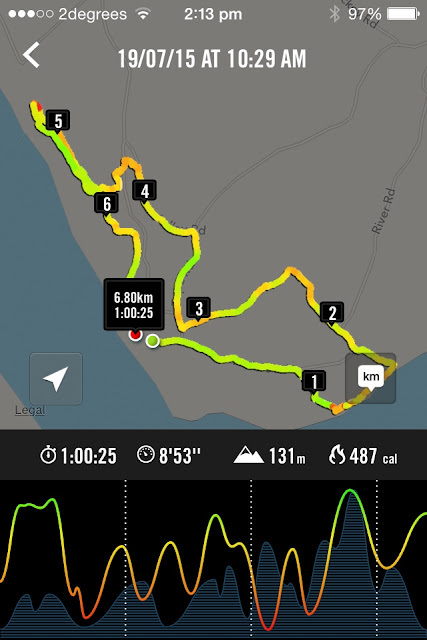 6 - 7 km was still in the wooded area but it was more flat and then there were more stairs but this time going down. And then it was the evil hill which wasn't that bad in the end. 7 - 7.47 km it started of with a bit of a downhill and then there was a steepish uphill section but we knew we were close to the finish and there were a couple of people in front of us that we wanted to pass so I dug deep and found some energy from somewhere and made a good finish. I forgot to turn off my app straight away so my time is a bit out and I was sad that there were no One Square Meals this time as I really could have used one. However, I did get my onions on bread and a Speight's Mid Ale so I was happy. Wow, June has felt like quite a short month. Lots of hearty winter meals in June and because I've been making more of an effort with my cooking, I've been finding ways to make the most of leftovers too. 1) I finally found a jar of sauce for pasta bake where you don't need to cook the pasta first, you just add dry pasta, the jar of sauce, a jar of water and then bake. After a while you add the cheese, bake a little more and it's done - really delicious too! 2) And because I was clearly in a cheese mood and had a cauliflower to use up I made some cauliflower cheese with some roast veg. 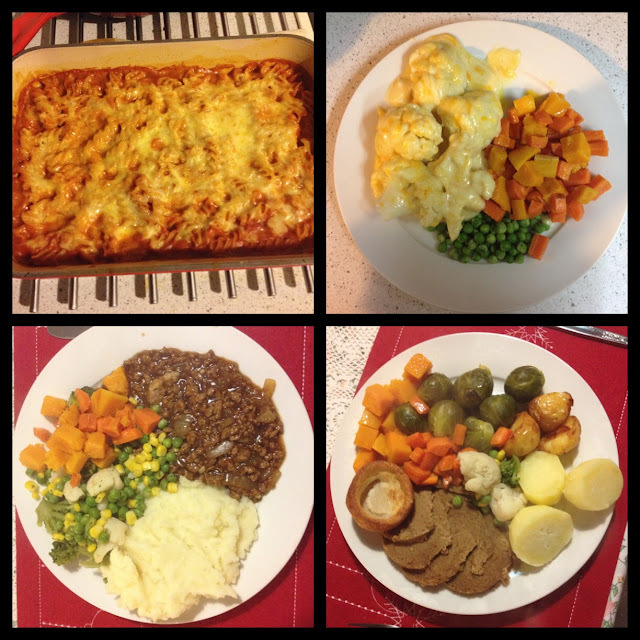 3) Vegetarian Quorn mince with mashed potatoes and veg. 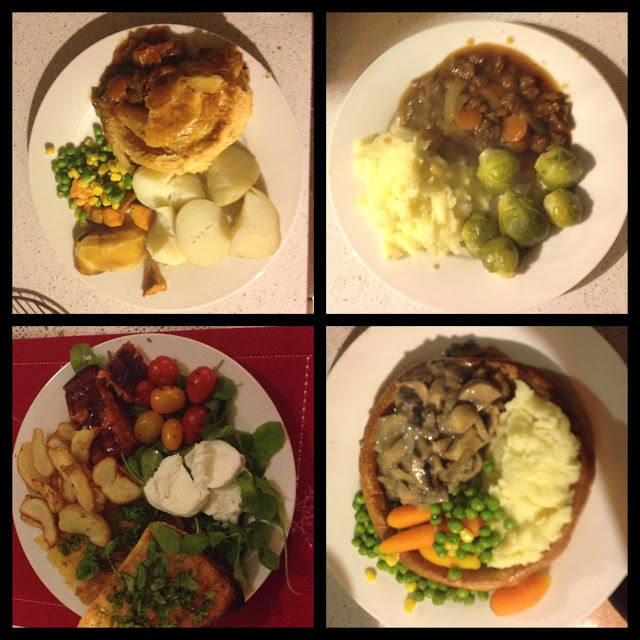 4) Vegan roast beef with vegetarian Yorkshire pudding and lots of veges before I covered it all in gravy! I don't want to waste any veges so now I just roast them all up in one batch and save them in the fridge to heat up for the next meal. 3) Grilled heirloom tomatoes, buffalo mozzarella, rocket, cajun salmon, garlic and basil ciabatta and some potato wedges - I was worried it wasn't going to be a substantial meal and I ended up making too much food! 4) A giant Yorkshire pudding filled with mushrooms in a vegan pepper sauce with mashed potatoes and veges. 1) Our midwinter Christmas meal of vegan turkey, roast veges, mixed veges, brussel srpouts and roast and boiled potatoes. This picture was taken before I went crazy with the cranberry sauce and gravy. 2) After Eights mint chocolates I had been saving for months for this occasion! 3) The steak pie I made using the leftover stew. It looks great but it was difficult to get out of the pie tin and then I had to divide it between us. I think I might purchase some individual pie dishes for the future. 4) Leftover mince on toast for lunch - this is a common kiwi lunch. 1) Sherry and cranberry nut medley - a perfect accompaniment to any TV show! One thing I like about doing this monthly recap of meals is that by taking photos of my plate I get to see just how much food I eat at one sitting. 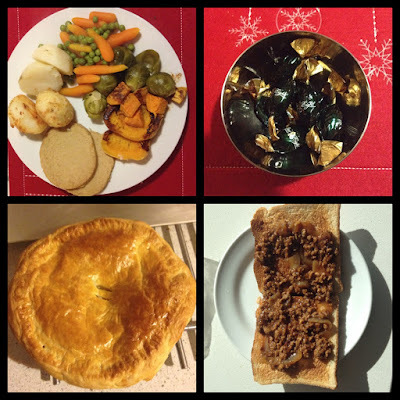 Portion control is a challenge. I'm starting to learn to put a more reasonable amount of food on plate with the option of going back for more if I'm still hungry and usually this means I have more leftovers to make into other meals. Despite not having a very high mileage month, my running has been going very well. I did two trail races this month (one was a mud bath the other was dry and had the best long downhill stretch) and in my training I can now run for 20 minutes non stop. I am so happy to have achieved this as I see it as a real milestone. I have the first race of series I did last year on the 12th July. It's 2.5km and last year I had to take walk breaks - this year I want to run it all and hopefully improve on my time too. I haven't been much of reader for several years now so I set myself a Goodreads challenge to read 12 books this year (aiming for one book a month) and I'm so surprised that I've completed this challenge in only 6 months. 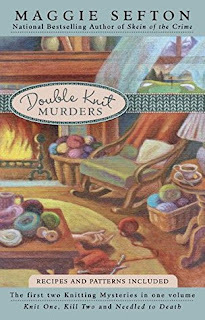 I finished reading Double Knit Murders by Maggie Sefton which are two murder mysteries in one volume. I love the silly puns in the titles - the first book is Knit One Kill Two, and the second one is Needled to Death. They are light entertaining reads akin to an episode of Murder, She Wrote. I particularly enjoyed the descriptions of all the yarn in the shop and the creations that main character and her knitting friends very making. The main character is new to knitting and at the end of the books there are knitting patterns for what the main character was making and also a recipe for something that was eaten in the book. Such a fun genre of book! 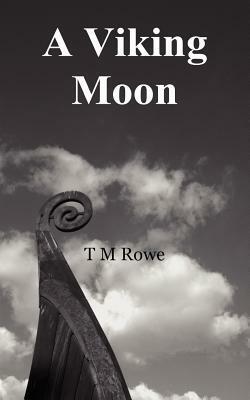 The other book I read this month was A Viking Moon by TM Rowe. I read this because I know the author and saw it was available at the library. It's the authors first book, a self published childrens book and as such it reads a lot like a first draft. There were spelling and grammar mistakes but it was also the use of language that was just a little off, a little amateurish. Having read Lois Lowrys books last month, the difference in the quality of writing was quite marked. The story is a time travel historical adventure and I think it could be really good with a little reworking and an Editor. I've looked through my phone photos and its all of food, sports games and our mini vacation. I didn't even buy anything new this month. I have however started on a new skin care regime. I'm finally getting a good bedtime routine in place where I thoroughly cleanse my face with Simple moisturising foaming face wash, I brush with Colgate optic white, then twice a week I apply Skinfood mud mask and then after that's washed off I follow up with Neutrogena night moisturiser. I'm not sure if there is any difference in my skin but I certainly feel like I'm taking better care of myself. What was your favourite Meal, Workout, Book or Look for June?